Each of the Palmetto Kingfish Tour qualifying tournaments have established themselves as seasoned events. The Lowcountry Open, Hooked on Miracles, James Island Yacht Club King Mackerel Tournament and Marlin Quay King Mackerel Shootout host an average of 100 to 150+ fishing teams per event, awarded combined annual-winnings in excess of $400,000 and made substantial donations to a variety of local and regional charities. To receive points and qualify for the Championship, teams must fish in at least two of these four events to amass the highest three-fish aggregate weight total. Each qualifying event will have its own rules and formats, and operate independently as they have for years. Palmetto Kingfish Tour teams must abide by each qualifying event’s rules. Each eve of competition in a Palmetto Kingfish Tour qualifying event between 8pm-9pm, a “signal” will be emailed and/or texted to all competing team captains. This “signal” will be some kind of hand gesture such as a #1 sign, an OK sign, a thumbs up, etc. While you are fishing, when you catch a fish intended to be weighed for Kingfish Tour points, you will need to take a picture of a crew member holding the fish, AND crew member(s) must make the visible “signal” given to the captain the night before. Attention: the fish MUST BE HOT. The fish must be boated and picture taken immediately, no less than 5 minutes, so the fish is obviously hot and fresh from the water. If a picture is taken of a fish, regardless of the hand signal’s presence, and the fish is not obviously fresh out of the water, that team will be subject to a polygraph. Lastly, once a team has a cell signal capable of transmitting an image, they will log into their Palmetto Kingfish Tour account and upload the picture of their fish. Each team will have up until 1 hour after the last fish has been weighed to submit their required photograph. The photo showing a fresh fish and unique hand signal guarantees the fish was caught on the boat, and on the respective tournament day. Each qualifying event has their own eligible day(s) of fishing, and a new signal will be sent each eve prior to fishing. Every eligible fishing day has a unique hand signal. No Picture Agreement: In the event a team does not send a picture at all, they will be required to take a polygraph test from a polygraph examiner of the Palmetto Kingfish Tour’s choosing; at their team’s expense. A 3 day window will be allowed for the team to take the exam and be cleared by the polygraph examiner. If a picture is received that does not show a fresh fish, the Kingfish Tour has the option to administer a polygraph. The team will be required to take the polygraph exam on the qualifying event’s awards day, and if this exam is missed, the 3 day window rule stated above will apply and the exam will be at the cost of the team in question. Each qualifying event has its own rules. Those rules govern all anglers participating in the qualifying event, regardless of the Kingfish Tour. Teams are required to fish a minimum of two qualifying events. Fish two or all four events to achieve a point-total high enough to qualify in the top 30 teams (TBD by boat entries or a top percentage), and you will receive an invite to the Championship. Any Kingfish Tour team winning 1st place in a qualifying event receives an automatic invite to the Kingfish Tour Championship. Single Engine Automatic Bid: The single engine boat-team with the highest top-3 aggregate weight of kingfish among all single-engine Tour competitors, receives an automatic invite to the Championship. You must fish 2 of the 4 qualifying events, and must fish each qualifying event from a tour-registered, single engine vessel. In an effort to insure honesty and integrity, all Kingfish Tour qualifying events will administer a mandatory polygraph test. If any Kingfish Tour team is disqualified from a qualifying event, no points will be received for that event and the Kingfish Tour team will be subject to disqualification without refund, and removed from contention for any future Kingfish Tour prize opportunities. This decision is at the sole discretion of the Kingfish Tour committee. Any team that wishes to receive points toward their qualifying total must: a) Register in each qualifying event under the same boat name as registered in the Kingfish Tour, and b) have AT A MINIMUM, either the registered captain or registered co-captain on board the boat during competition. 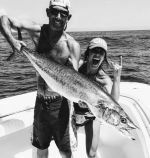 A Kingfish Tour team may fish whatever boat they choose, and there are no limitations to changing equipment during the season. The team that achieves the highest point total by the end of the four qualifying events will be awarded the "Team of the Year" trophy. In the event of a tie for points at year-end, the team weighing the single largest kingfish during qualifying events will win the TOY honors. ​Note: Purse payouts for the Palmetto Kingfish Tour and/or Tour Championship are 90% of net operating expenses incurred by the tournament.